That call from Julie yesterday evening could only have been for one reason. Yep, a request to head to Queensland to help out, as State Operations Officer in the Incident Management Team (IMT). I arrived at the Milton office around 1345 hours today (no AMs or PMs in this operation thanks) and walked straight into the daily phone conference with the operations officers from the different locations around the state where Red Cross is deployed. After that, it was straight into a meeting of the IMT. A welcome from Commander Shanna, a quick briefing from Paul, who I am relieving (thinks “hmmm, he did seem to be in a bit of a hurry to get rid of that lovely red tabard”), and straight into it. So here I sit at my digs in Spring Hill for the next few days, summarising my thoughts. Firstly there is a great team in place, both in the IMT and out in the field. And back in Melbourne (hi Jules). As usual, for major emergencies, there are people deployed from all around the country. In terms of my peers from Melbourne, there’s Angela, Christine, Graham, Mairead, Mo, Andrew, Rob from an IMT and management perspective, and a wealth of REDiSupport team volunteers. And please, please, don’t shoot me if I’ve forgotten you. It’s been a long day. So what have been the key issues to be addressed today? I guess the main one is that 14 volunteers on their way back from Emerald, are still, as I type, circling around somewhere up there because Brisbane Airport is closed due to storms. If they don’t get in tonight and need to go back to Emerald or end up going somewhere else, how will we manage that? Note to self – make sure I get a list of after hours numbers for the Logistics and Planning guys tomorrow. Secondly, there’s a request in for an operations officer, an evacuation centre manager and a recovery centre manager to arrive in Emerald on Friday to relieve the existing people. That needs to be followed up early tomorrow to make sure it’s all happening. Finally, it looks like St George is about to get very busy over the next few days and we need to make sure Eleanor, who I worked with on the last deployment in Brisbane, and who rocks, gets all the support she needs as the local operations officer. And I need to cancel my dentist appointment. P.S. The plane did finally land and yes, we had a few issues to resolve, but we got there in the end. Thanks Team! How did you spend New Year’s Eve? 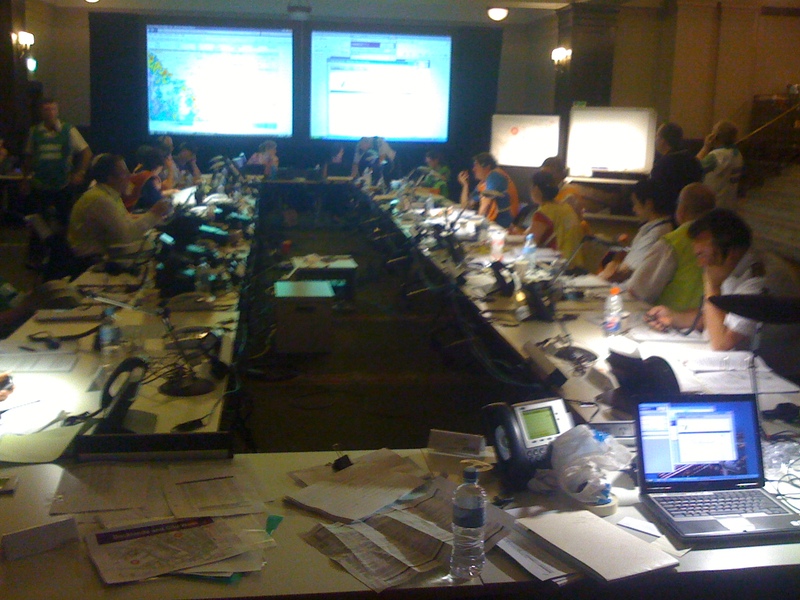 I know how I spent mine – in the Municipal Emergency Operations Centre (MEOC) for Melbourne City, as Red Cross’s representative for the New Year’s Eve celebrations. Red Cross had been contracted to provide first aid in Federation Square. It’s just short of 9:00pm. The fact that I have time to be typing this is really quite surprising – things are fairly quiet for our first aiders at the moment. Many people I talk to about my Red Cross liaison activities don’t really appreciate the organisation that goes into putting these events on, including our first aiders. Let me try and give you a quick snapshot. We are all located in an extremely large room on the ground floor of Melbourne Town Hall. A quick head count has come up with 32 people who are currently in the room, which is set up with a work area for each agency. Each person is generally equipped with all sorts of combinations of laptops, radios, computer screens, phones, etc, etc. Each person wears a tabbard to identify the agency they represent – I am currently wearing a very fetching orange number with “First Aid” across the front and back, because the council doesn’t have a Red Cross-specific one. As you can see, we also have two large screens on which are currently displayed a log of issues and the BOM weather radar, which is tracking the big storm about to hit. If necessary, we can display images from a number of cameras spread around the city, to hone in on particular areas of concern. There are also white boards and maps for use by any agencies if required. It is an amazingly well oiled machine. So who is represented in the MEOC? Oh look, the Lord Mayor’s just dropped in. Everyone here fundamentally has two roles – to ensure the safe and successful management of the event and to liaise between each other where an issue requires the intervention of more than one agency, e.g. Red Cross requiring an Ambulance Victoria vehicle. I am also looking after all the two-way radio traffic for our Red Cross team members. I arrived about 5:15pm and expect to knock off at this stage about 2:00am tomorrow morning. With the rain, who knows, we might even get away early. And on that note, it’s time to finish typing as things are starting to get busy. I’ve just organised the first ambulance to attend our first aid post, no doubt the first of many. Hope you had (or will have) a safe New Year’s Eve. I know I did. And to all my Red Cross colleagues, congratulations. You rock! With Carol and me both on leave this week, we’ve been looking for a couple of day trips to do. Carol had seen a news story on the new supermarket opening in Marysville and how the locals were encouraging visitors to come along and help get the town back on its feet after the fires. What a good idea, we thought. So off we headed to Marysville this morning. It was certainly a trip of contrasting emotions. I didn’t get to Marysville during Red Cross activities – most of my time was spent in Kinglake, Kinglake West and Whittlesea. It’s still hard not to have an emotional attachment. As we drove into the town, it was impossible to miss what had happened. All the debris is gone, but the bare cement slabs and cleared allotments give it all away. We parked where the Caltex service station had been. The sign is still there, strangely the first thing that sprang to mind was a question about why Marysville would need a 24 hour service station. Unfortunately, it’s now 24 hours less than that – all that remains other than the sign is the concrete driveway. Neither of us could get out of the car immediately, feeling the need to gather ourselves emotionally before we ventured forth. The main purpose of our visit was not to go and see for ourselves what had happened. I’d had enough of that at Kinglake and Kinglake West, and Carol had assisted people at the relief centre at Lilydale. The idea was to try, in our own small way, to help Marysville get back on its feet. It’s hard to do that in a major way – there is still only a minimum of businesses operating. But we bought an ornamental frog and some place mats at a gift shop, and a necklace at another. We had lunch at the cafe, which was teaming with people, none of whom seemed the least bit concerned about the delay getting served. We went to the supermarket and paid $12 for a Cherry Ripe, a small bottle of lemonade and a jar of honey. Normally I’d have a few words to say about those prices, but not on this occasion. I’d never been to Marysville before the fires – people say it was an extremely pretty place to visit. It’s certainly not that now, but gee it’s great to see it slowly getting back on its feet. There is a cleared housing allotment across the road from the cafe where the only thing remaining is the front gate, pretty much totally covered by a large Christmas decoration. How fantastic it is to see the Christmas spirit prevailing despite the losses that have been experienced. The most enduring memory from the day was the ferns growing throughout the forest on the drive between Marysville and Healesville. It was apparent the fires had been through this area, apparent from the blackness of the gum tree trunks and the lack of foliage. However, just about everywhere throughout the forest are these fantastic green ferns. The flames have clearly been the catalyst for these to regenerate more impressively than ever. We were tempted to head over to Kinglake as well, but time and emotion said no, and we headed for home, via the White Rabbit Brewery and Beechworth Bakery in Healesville. I encourage anyone reading this to make the effort, head into Marysville and give the local businesses your support. They deserve it! I was super-impressed to hear that a colleague has recently joined up with the SES. He has a full day training session today. Nice work. We need all the emergency services volunteers we can get. Whether it’s working with our great volunteers at Red Cross, or with other teffific groups like CFA or SES, we need you. Please think about how you can help and join up. Well, isn’t that a mouthful? I wanted to spend a bit of time blogging about AIIMS. Why? Firstly, it’s something that I need to become much more strongly across than I am at the moment. I figure that if I have to write about it, to do that properly, I’ll need to read all the material I’ve got so far. Secondly, for those of you who aren’t closely involved in emergency services, I wanted to give a bit of an insight into the structured way that incidents should be managed. It’s not simply a matter of rushing around pointing wet stuff at hot stuff so to speak, and hoping it all ends up OK.
As the title indicates, AIIMS is an incident management system, or methodology, that is or will be used by a number of different emergency service agencies in Australia. Red Cross is in the process of implementing AIIMS for incident management. So why introduce AIIMS? There are three key positives from my perspective. Firstly, it just makes extremely good sense to approach incident management in a methodological, structured way, just like most other things we do. Cooks do things according to recipes, ambulance officers have protocols, pilots have checklists. Why wouldn’t emergency management be undertaken based on an appropriatly documented, structured approach? Perhaps it seems more logical to me because I’ve worked in IT for 30 years and we are absolutely conditioned to doing things based on methodologies. The second positive about AIIMS is it is scalable. Not all Red Cross activations will be of the magnitude of the recent bushfires. Indeed, when I was activated this afternoon to provide 25 meals to emergency services personnel at a police-controlled incident, my first thought was how I should manage it according to the AIIMS guidelines. Thirdly, the first I in AIIMS stands for Inter-service – AIIMS has already been rolled out amongst the various fire authorities and is being progressively rolled out by other emergency service organisations. This means the various agencies will be able to more easily and effectively work together at the same incident, based on a consistent management approach. So what are the key aspects of AIIMS? The first thing to understand is it is all about management by objectives. An Incident Action Plan (IAP) is developed to document priorities, objectives, strategies and tactics. Indeed, this is exactly the same as what should happen in business, with the development of a business strategy and the accompanying tactics that will be used to achieve the strategy. The following diagram nicely shows the functional structure associated with implementing the IAP. The grey box shows the Incident Management Team, which comprises four roles, namely Red Cross Commander, Planning Officer, Operations Officer and Logistics Officer. To put it simply, the Red Cross Commander is responsible for the management of the incident. The Planning Officer and all his subordinates are the “thinkers”. Similarly, the Logistics people are the “getters” and the Operations people are the “doers”. Put another way, the planners gather information, prepare plans and strategies and provide administrative support. The logisticians obtain and maintain human and physical resources. The operations people manage activities and resources. To make it easy to identify relevant people in the hurly burly of an emergency operations centre, different coloured tabards are used for the different functions, white for Red Cross Commander, yellow for Planning, red for Operations and blue for Logistics. The diagram above shows a range of different units sitting within the Planning and Logistics functions. This is meant to be a brief summary of AIIMS, so I won’t go into that detail here. Suffice to say, in a big incident like the February fires, most of these units were in action as part of Red Cross’s response. For my activation this afternoon, I was Red Cross Commander as well as wearing the yellow, red and blue. I had one person as a team member within Operations, who picked up and delivered the meals. I felt like Joseph with his technicolour dream coat. Only joking of course, but a good example of the scalability. Hopefully this has given a good high-level insight into the implementation of AIIMS at Red Cross. There’s a lot of work needs to go into the implementation over the coming months, but I reckon it will be great when it’s up and running. Red Cross recently sent out a lapel badge to each of its volunteers in Victoria. Along with the new uniform items and the upcoming afternoon tea with the Governor for those who assisted with the bushfires, they are small but greatly appreciated ways of recognising our volunteers. Well done to the team in North Melbourne.